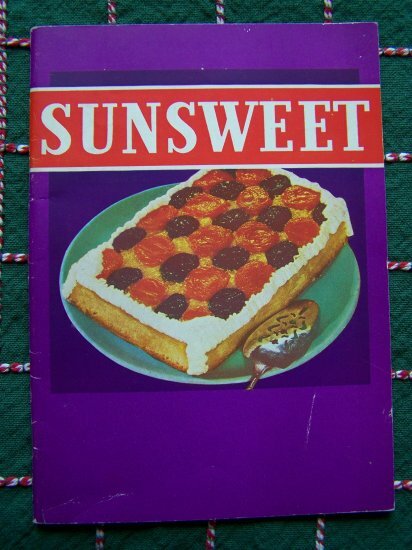 1940's Vintage Sunsweet Cookbook. Recipes using dried fruits; Prunes, peaches, apricots. Recipes; Bread and sandwiches 6, cakes and cookies 9, conserves 4, confections, 3, frozen desserts 5, fruits and compotes 7, meats and fritters 4, pies and pastries 9, puddings 8, salads 5. Softcover cook book is 7 x 5" and 41 pages. More vintage cookbooks listed. ** NOTE Softcover cookbook has been used and most likely has writing, stains etc. S & H to the USA is $2.00. I can fit quite a few items in a priority flat rate envelope for only $5.00 shipping. S & H to Canada $3.00. Ask about combined shipping.